Chicken piccata is a dish that deserves to be part of every home cook's repertoire. The crowd-pleasing recipe is easy to make and ready in under half an hour—plus who can say no to a buttery lemon sauce? Thinly sliced chicken is dredged in flour, then quickly pan-fried to form a golden crust. You then make the delicious lemon, caper and butter sauce in the same pan—make sure to scrape up all of the crispy bits! This weeknight chicken dish is best served with something starchy to soak up the sauce, like mashed potatoes or plenty of crusty bread. If you or your family have gluten sensitivities, try coating the chicken in cornstarch or your preferred gluten-free flour mix instead of all-purpose flour. Using cornstarch results in an even crispier, crunchier exterior and seals in moisture in the meat. Per Serving: 410 calories; 23g fat; 10.5g carbohydrates; 37g protein; 127mg cholesterol; 356mg sodium. Classic chicken piccata! So delicious, love the lemon flavors. This is also my wife's favorite dish, she loves it when I make it. It goes perfect with sautéed spinach. I love chicken piccata, but this was my first time making the recipe! It was so easy, why didn't I try it sooner? Such a classic Italian dish, and it was incredible. My boyfriend and I ate the entire thing! This is perfect for weeknights and date nights. I can't wait to make it again! 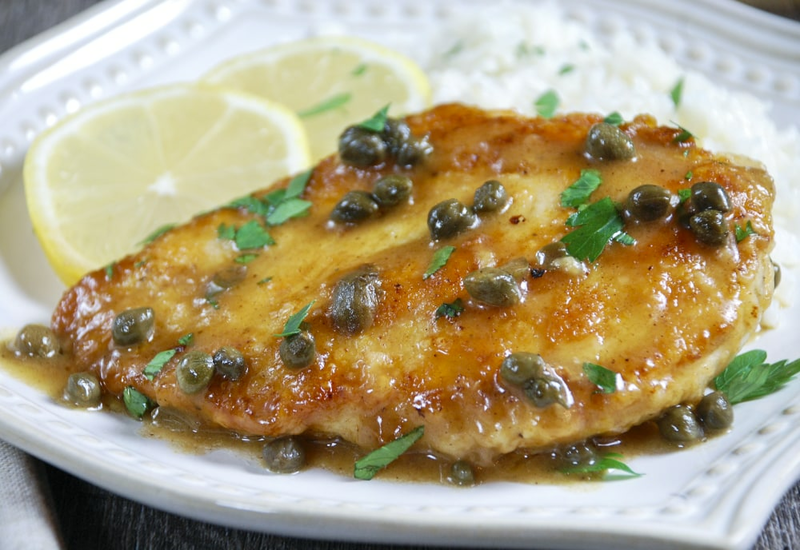 Classic chicken piccata! I didn't use the capers though. If you really love the lemon flavors you can add a little lemon zest on top for garnish. My wife has a gluten allergy, so I coated the chicken in a gluten free flour mix instead. I should have used cornstarch though. The chicken wasn't as crispy as I would have liked. Next time I'll use cornstarch. Seasoned the chicken with garlic powder and onion powder, and served it with cauliflower mash and sautéed green beans. Really good dinner! Delicious, was a huge hit! I added smoked paprika.